I love the Mr. Putter and Tabby series for 1st and 2nd grade readers or a fun read aloud for K and 1st grade. There are about 20 books in the series and would make great gifts. My personal favorites are: Mr. Putter and Tabby Take the Train, Mr. Putter and Tabby Feed the Fish, Mr. Putter and Tabby Fly the Plane and Mr. Putter and Tabby Row the Boat. 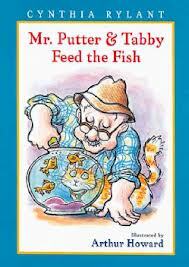 Mr. Putter is an elderly man who lives with his fine cat Tabby. He lives next door to Mrs. Teaberry and her naughtly dog Zeke. Together, Mr. Putter and Tabby and Mrs. Teaberry and Zeke go on many fun, and funny, adventures. The three short chapter format is perfect for young readers. The illustrations by Arthur Howard are colorful and engaging. Highly recommended for young readers.